Taking a look at the Round of 16, we see some great matches coming up. Paraguay-Portugal: Both finished second in their group and are very evenly matched. Portugal has the edge with best goal difference. Spain - Thailand: Thailand advanced for first time but is no match for Spain, who can win it all. Ukraine-Japan: Ukraine won its group and is unbeaten with two wins and a draw. They should edge Japan. Iran-Colombia: Iran finished second in its division and is undefeated with two wins and a draw. Colombia has two losses but a positive goal difference. Iran has the better goal difference and has the edge here in a very interesting game. Italy-Egypt: Italy has been one of the dominant teams and a strong contender to win the cup. Egypt finished third in its group and hase two losses. Italy is the clear favorite to win this one. Russia-Czech Republic: Russia has been the best team in the tournament with 27 goals for and none against. The Czech Republic finished second in its group with a negative goal difference and is no match here. Russia is a very strong team physically, and Brazilian-born Eder Lima is the tournament's top scorer. Brazil-Panama: Panama scored an impressive 14 goals in group play but gave up 15. Brazil is the defending champion and a popular favorite to repeat. They should win easily. It will be interesting to see if Panama can continue to score. Argentina-Serbia: Argentina finished second in its group behind Italy and was 14-5 in goals for and against. They won the CONMEBOL qualifying tournament ahead of Brazil and have been our surprise pick to win the World Cup. This will be a very even match against a Serbian team that won its group undefeated with 12 goals for and 5 against. Argentina was set back, however, when Matias Lucuix fractured a bone in his right leg against Egypt. We still pick Argentina to edge Serbia in one of the toughest matches of the Round of 16. 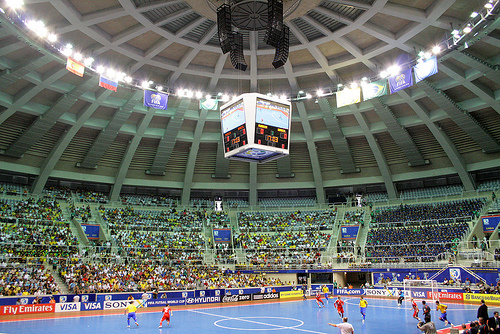 The FIFA Futsal World Cup is the most interesting sporting event in the world right now. Futsal is one of the world's great sports and the action from here on will be superb.